On the fourth and last floor of a historic building without elevator, Fico Penthouse 9 an apartment consists of a large and bright space on two floors. On the entrance floor there are a spacious living room, a kitchen with a dining area, a bathroom and a terrace. The living room is furnished with a 3-seater sofa - which can be turned into a sofa bed if needed -, two armchairs and a big old chest. The dining area, with a table seating 4, is right next to this area, separated by a wooden ladder that leads to the upper floor: the fully equipped kitchen - with dishwasher and washing machine - overlooks the dining area. By the entrance door it is possible to access the terrace, where an elegant table and four chairs allow to fully enjoy the view of the churches and the rooftops of many ancient buildings in the heart of Rome. The small service bathroom is furnished with a shower. On the upper floor there’s the night area, furnished with a double bed and a single one, a spacious wardrobe, a wooden library with several drawers and a full bath with a tub-shower. The apartment is enriched with wooden beams and refined iroko parquet floor. It is air conditioned and fully equipped (TV, wi-fi). All windows overlook piazza del Fico, very popular among locals for its nightlife, and are fitted with double-glazing to isolate the inside from outside noise. The apartment is located in a strategic position to reach the most interesting sites of Rome with pleasant walks. Beautiful apartment in a wonderful location! Perfect location! Wonderful view! Great Space! We really enjoyed staying here. Walking distance to everything! 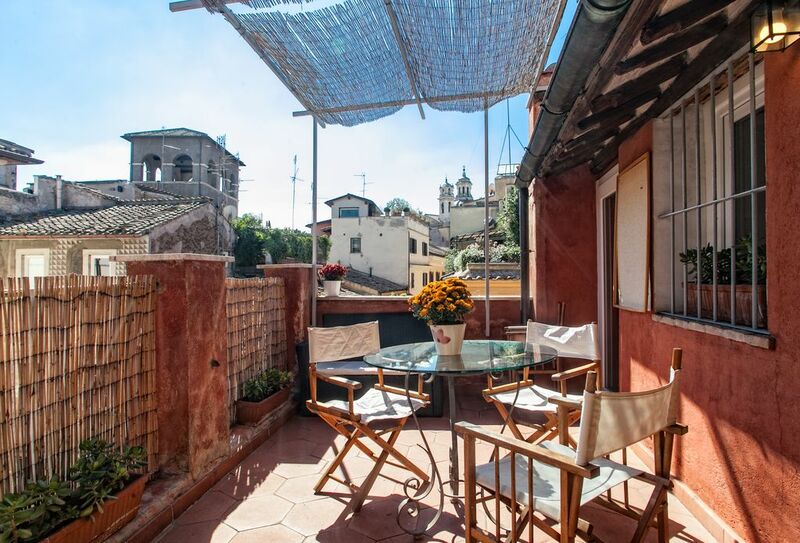 From this apartment you can reach the most interesting places in Rome with pleasant walks: Piazza Navona, Pantheon, Trevi Fountain, Spanish Steps, Campo de 'Fiori, the Vatican City with its Saint Peter's Basilica, Castel Sant'Angelo and the Vatican Museums.